Absolutely love it! 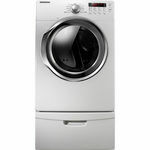 I purchased the washer as well! I use this product often to do the laundry in my home. My family loves the easy to operate features. Love this dryer, never had a problem and use it regular. Clothes are always dry when timer goes off. It is a quiet and it gets the job done. I clean my filter after every job so it never builds up. 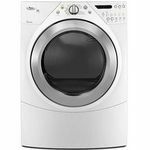 Since I was on a budget, I went with the LG dryer since it was significantly cheaper than the other brands / models. It works fine, but what I enjoyed most about this dryer is that its energy efficient. 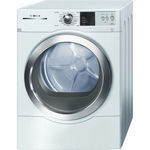 Great dryer, reliable and easy to use. 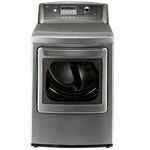 I think this LG dryer is a great and reliable machine to use. It has some merits such as it is so organized in its timings, smooth and easy. It's not that type of machine which will Produce a loud noise on power. You can depend on it in everyday's clothes, towels and others. 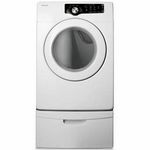 It has great advantage as it has a large number of programs which you can adjust To handle your favourite way of drying. It has the anti bacterial program which is not found in many machines. Don't expect your clothes to be over wrinkled, it will be much more slightly wrinkled than any other one. The clothes will be not so moist even in the short duration cycle. 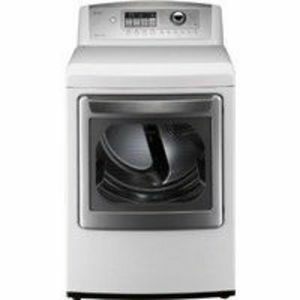 Finally speaking i would recommend this LG dryer as it lacks any of the disadvantages.